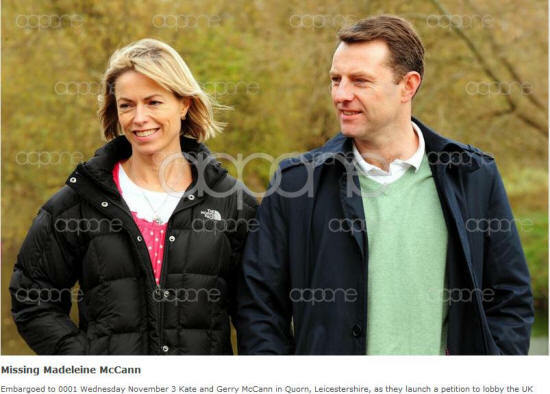 Kate and Gerry McCann walk after speaking about the disappearance of their daughter Madeleine at a news conference in Quorn, central England, November 2, 2010. Madeleine McCann disappeared from her room at a resort in Portugal's Algarve on May 3, 2007, just days before her fourth birthday, as her parents were dining at a nearby restaurant. The case remains unsolved. Kate and Gerry McCann pose after speaking about the disappearance of their daughter Madeleine at a news conference in Quorn, central England, November 2, 2010. Madeleine McCann disappeared from her room at a resort in Portugal's Algarve on May 3, 2007, just days before her fourth birthday, as her parents were dining at a nearby restaurant. The case remains unsolved.